An In-Depth Review of the Pacsafe CItysafe 100 GII Anti-Theft Bag. 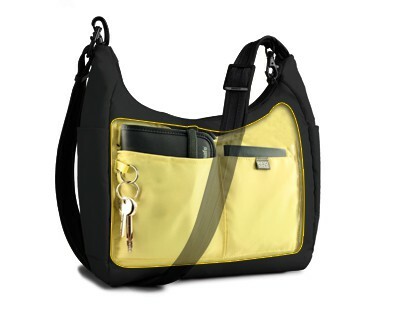 This bag from Pacsafe is perfect for Europe, South America or other pickpocket spots. A few weeks ago I posted an article about pickpockets in Europe that got a lot of responses. My number one tip for avoiding pickpockets is being aware of your surroundings, but sometimes that can be difficult — so the next best line of defense is a pickpocket proof bag. When it comes to anti-theftbags the top brand is Pacsafe. I recently had the opportunity to test out the Pacsafe Citysafe 100 GII anti-theft bag and it has a lot of nifty anti-theft features. As you can see from the photo, the Pacsafe Citysafe 100 GII is a fairly compact bag (9.8″ x 7.5″ x 3.7″) — which I prefer when I travel (I don’t like bulky bags). 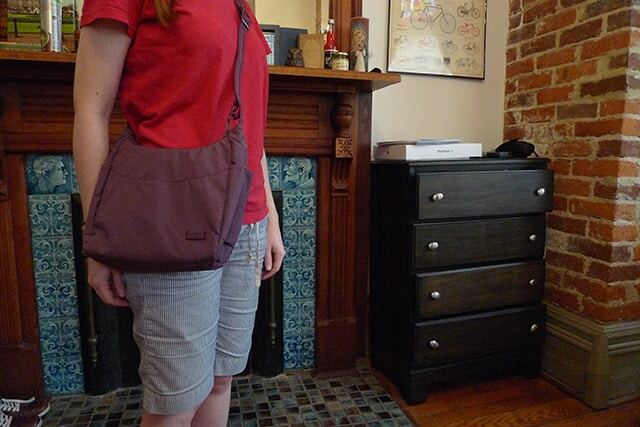 However, this bag comes in a few larger sizes if you want something with more storage space. It is big enough to hold a point-and-shoot camera, some books, pens, a small umbrella, and a few other small things. This model is too small to fit a light jacket. Like all Pacsafe products, this bag has a thin wire-mesh sewn into the lining of the bag. This mesh prevents would-be thieves from cutting the bag to gain access to your belongings. Having a zippered bag will deter a large majority of pickpockets, but having the zipper clipped will pretty much stop all of them. It isn’t as secure as locking them closed, but locking and unlocking is a huge pain. I actually prefer the clip system since it will stop pickpockets, but it still makes it fairly simple for you to open. 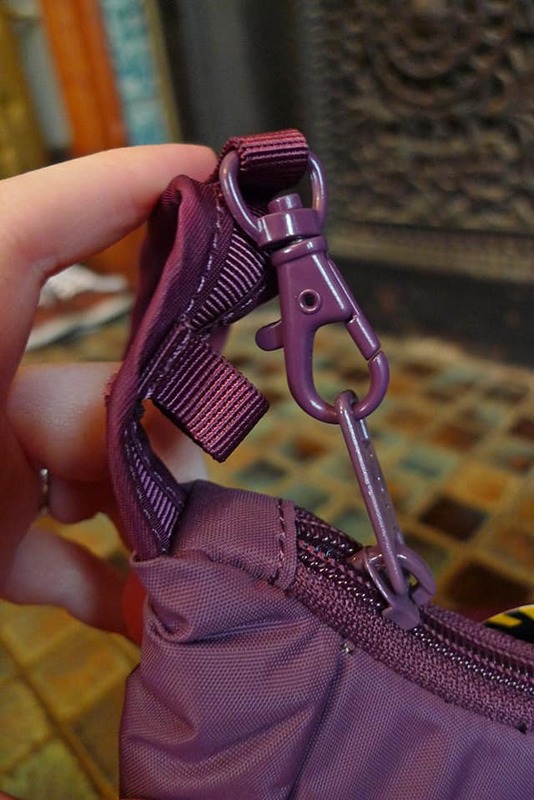 The shoulder strap can also be unhooked via a locking clasp — which gives you the ability to hook your bag to your chair leg (or whatever) to secure it. 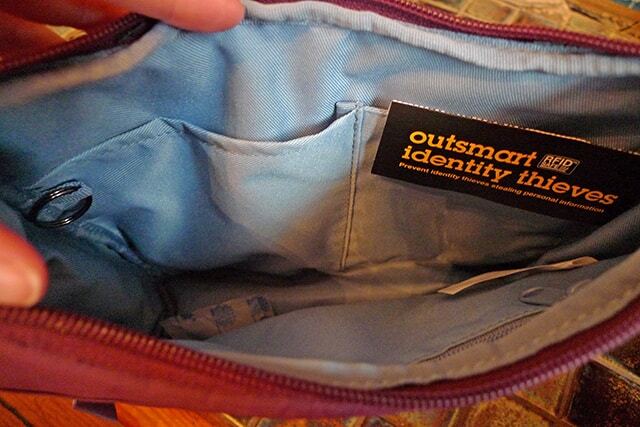 This is super handy when you’re eating at a restaurant or riding on a train, it stops people from snatching your bag. 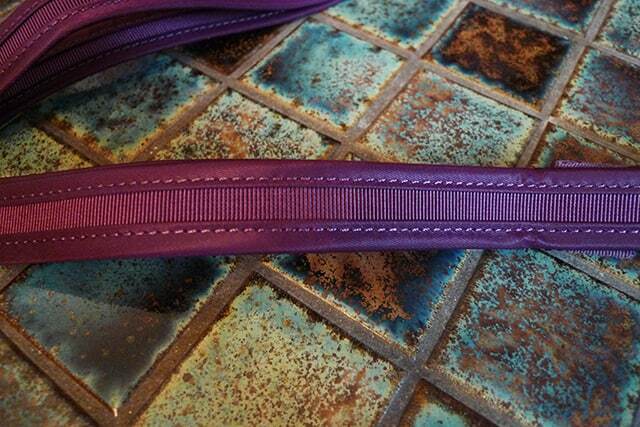 The strap also has two thin wires sewn into the inside which makes it slash proof. 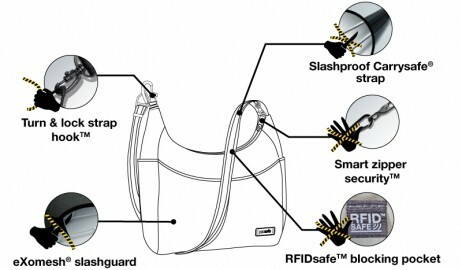 The bag also has an interior RFID-blocking pocket that prevents thieves from using a card reader to steal the data from your credit cards and passport. 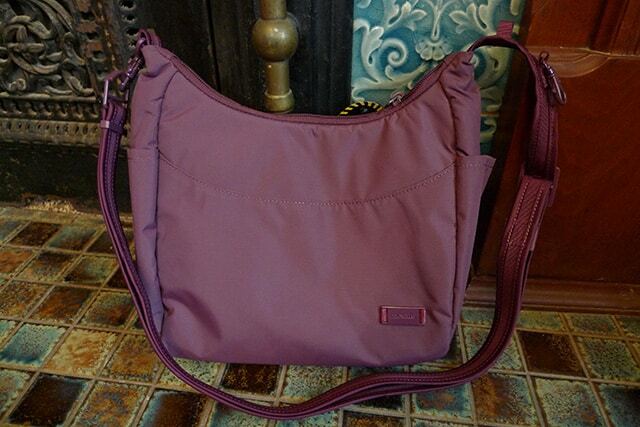 The inside of the bag has two smaller pockets for organization and an interior zippered pocket. You can’t really go wrong with the Pacsafe Citysafe 100 GII if you’re looking for a small anti-theft bag. Like all Pacsafe products, the Citysafe is well made and has a lot of handy features. The only potential downside is the price — because at around $60 it might be a little expensive for budget travelers. However, it might be a small price to pay compared to getting your stuff pickpocketed. However, one thing I would have liked to see is a small zippered pocket on the outside so I could easily access small non-valuable things more easily (maps, pens, etc). The Pacsafe Citysafe 100 GII is available on Amazon for about $60 and it comes in multiple colors (black, blue, purple and brow). The Citysafe line also includes the larger Citysafe 200 GII and the even larger Pacsafe Citysafe 400 GII Hobo Travel Bag (which is nice if you carry a lot of stuff).